Published on 08. 11. 2012 in comics and cartooning, film, tv, video and hype & linkage. Closed Tags: Bogforum 2012, Jørgen Leth, Thomas Thorhauge. Kinda unrelated: yrs. 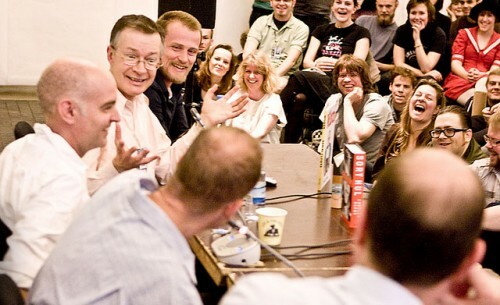 truly interviewing Dan Clowes, Chris Ware, and Charles Burns along with Paul Gravett, at Komiks.dk 2010. Photo by Frederik Høyer-Chr. This weekend sees the Copenhagen Book Fair, or Bogforum — the book event of the year in Denmark. This year, the fair has moved to Bella Center in Amager to accommodate the crowds. Let’s hope people who have gotten used to the proximity afforded by the traditional venue, Forum, at border of Frederiksberg. Comics have always been represented at the fair in some measure, but this year sees an unprecedented amplification of their presence, in that the Danish comics grass roots organizations have been given a large area in which to set up for free. The Danish Comics Council and the festival organisers in Copenhagen Comics have teamed up with The Association of Danish Comics Creators, the Ping Awards, the Blågård library, and the Goethe Institute to create a nexus of all Danish comics realities at the fair. We provide extensive programming consisting of live drawing by a range of Danish artists throughout the whole event, as well as interviews with creators, workshops for children, a relaxing reading area, and other surprise goodies. To see the whole programme, please visit the website of the Danish Comics Council, and please drop by — we’ll be in area e-006. Also, Thomas Thorhauge, chairman of the Danish Comics Council and sometime Bunker contributor will be participating in the general programming, being interviewed by the great Jørgen Leth — writer, critic and filmmaker (The Five Obstructions) — at 3.40 pm on Friday ‘under the clock’ in area C2-023. They will be talking about his newspaper strip on film, True Story, which was collected in book form last year as Det sidste ord. Not to be missed. With writer Benni Bødker, Thorhauge is also participating in an interview on the recently published YA book Djævlens øjne, which he illustrated. That’s Saturday at 3pm at the childrens’ stage, after which the two of them will be signing their book in area C3-038. Check out the whole programme here.